The Routledge Handbook of International Planning Education is the first comprehensive handbook with a unique focus on planning education. Comparing approaches to the delivery of planning education by three major planning education accreditation bodies in the United States, Australia, and the United Kingdom, this handbook will help to meet the strong interest and need for understanding how planning education is developed and delivered in different international contexts. The handbook is divided into five major sections, including coverage of general planning knowledge, planning skills, traditional and emerging planning specializations, and pedagogy. An international cohort of contributors cover each subject’s role in educating planners, its theory and methods, key literature contributions, and course design. 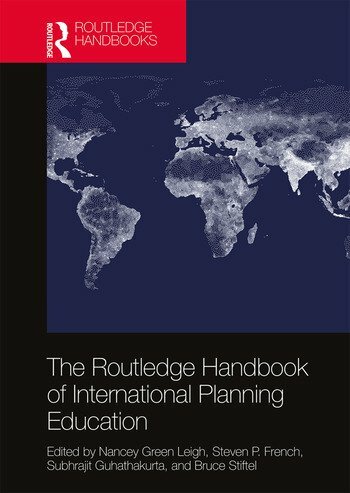 Higher education’s response to globalization has included growth in planning educational exchanges across international boundaries; The Routledge Handbook of International Planning Education is an essential resource for planners and planning educators, informing the dialogue on the mobility of planners educated under different national schema. Nancey Green Leigh is the Associate Dean for Research at the College of Design and Professor at the School of City and Regional Planning at the Georgia Institute of Technology. She is the author of more than 50 articles and three books, including Planning Local Economic Development (with E. J. Blakeley), now in its sixth edition; Economic Revitalization: Cases and Strategies for City and Suburb (with J. Fitzgerald) and Stemming Middle Class Decline: The Challenge to Economic Development Planning. She was co-editor of the Journal of Planning Education and Research from 2012 to 2016, and was elected a Fellow of the American Institute of Certified Planners in 2008. Steven P. French is dean of the College of Design and professor of City and Regional Planning at Georgia Institute of Technology. He previously served as director of the City Planning program, director of the Center for Geographic Information Systems at Georgia Tech, and associate dean of research. French’s teaching and research activities focus on sustainable urban development, land use planning, GIS applications and natural hazard risk assessment. He is the author or co-author of more than 25 refereed journal articles and four books, and has served on the editorial boards of the Journal of the American Planning Association, Journal of Planning Education and Research, Journal of the Urban and Regional Information Systems Association and Earthquake Spectra. Subhrajit Guhathakurta is Professor and Chair in the School of City and Regional Planning as well as Director of the Center for Spatial Planning Analytics and Visualization (CSPAV) at the Georgia Institute of Technology. He was previously Associate Director of the School of Geographical Sciences and Urban Planning at Arizona State University (ASU) and among the founding faculty members of ASU's School of Sustainability. He is the immediate past Co-Editor of the Journal of Planning Education and Research and is on the Editorial Board of the Journal of American Planning Association and several other urban planning journals. He is a member of technical advisory boards of the Association of Bay Area Governments and the Atlanta Regional Commission. Bruce S. Stiftel is Professor at the School of City and Regional Planning at the Georgia Institute of Technology. His most recent books are Adaptive Governance and Water Conflict (co-edited with John T. Scholz), and Dialogues in Urban and Regional Planning, Volume 2 (co-edited with Vanessa Watson and Henri Ascelrad), and he served as consultant to UN-Habitat in production of the World Cities Report 2016. He previously served as president of the Association of Collegiate Schools of Planning, co-editor of the Journal of Planning Education and Research, founding chairperson of the Global Planning Education Association Network, and member of the Planning Accreditation Board. He is a member of the editorial boards of Planning Theory, International Planning Studies, Journal of the American Planning Association, and Town Planning Review, and represents the Global Planning Education Association Network to UN-Habitat's University Network Initiative.